Head: Prof. RNDr. Martin Loebl, CSc. Vicehead: Doc. RNDr. Pavel Valtr, Dr.
Scientific secretary: Mgr. Jan Kynčl, Ph.D. In all e-mail addresses, "@kam" means "@kam.mff.cuni.cz". If you are interested in more detailed information, look at the list in study information system (SIS). 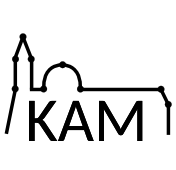 You can find KAM guests at Malá Strana, floor 3, room #324 (phone 22191 - 4374, 4375). In 2012 seven long-time members of our Department - Jaroslav Nešetřil, Jiří Sgall, Zdeněk Dvořák, Vít Jelínek, Daniel Kráľ, Ondřej Pangrác, Robert Šámal - moved to the newly created Computer Science Institute of Charles University. There is a close collaboration between the Institute and our Department.